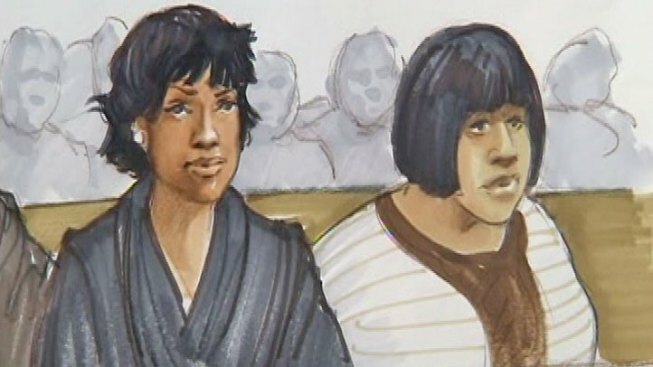 In this courtroom sketch, Jennifer Hudson (left) is seen sitting next to her sister, Julia. "We have many people to thank but our first thank you is to God, always. We are so grateful to prosecutors James McKay, Jennifer Bagby and Veryl Gambino and State's Attorney Anita Alvarez and her team for their dedication and tireless work from the beginning. We have the best police department and they have been with us every step of the way. We thank all of the State's witnesses who came forward on our behalf. We have felt the love and support from people all over the world and we’re very grateful. We want to extend a prayer from the Hudson family to the Balfour family. We have all suffered terrible loss in this tragedy. And even if our gospel is veiled, it is veiled in them that perish: in whom the god of this world hath blinded the minds of the unbelieving, that the light of the gospel of the glory of Christ, who is the image of God, should not dawn upon them (2 Corinthian 4:3-4). It is our prayer that the Lord will forgive Mr. Balfour of these heinous acts and bring his heart into repentance someday."